The Early Childhood Care and Education Scheme (ECCE) provide 3 hours of care per day. Kids Klubs offers this service over a 38 week period from September-June. Since September 2016, this scheme has been extended to include children from 3 years old, and involves three intakes throughout the school year. Address : Bayside Leisure Centre, Bayside Square, Sutton, Dublin 13. 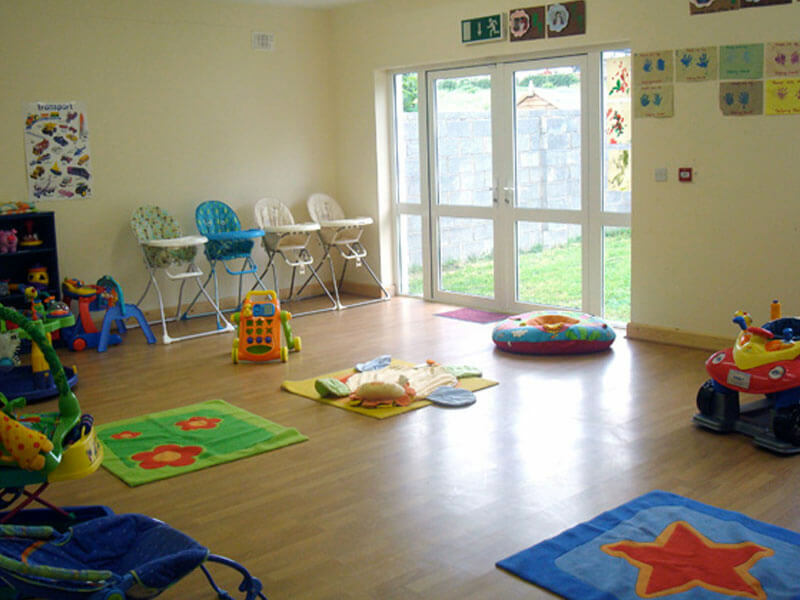 This branch opened in Bayside in April 2003, to a much needed demand in the area for flexible and quality childcare. This was at a time when families were returning to the area, and needed a reliable option where their children could be cared for in a home from home environment. Starting as two classrooms, we have steadily grown to accommodate the changing community with many, many young people filling our classrooms! Kids Klubs has been delighted to become so embedded in this community, and now we have a thriving and noisy pre-school and after school club that has proudly supported families year after year. Many families will remember Kids klubs as the old snooker halls, but it certainly looks different now! 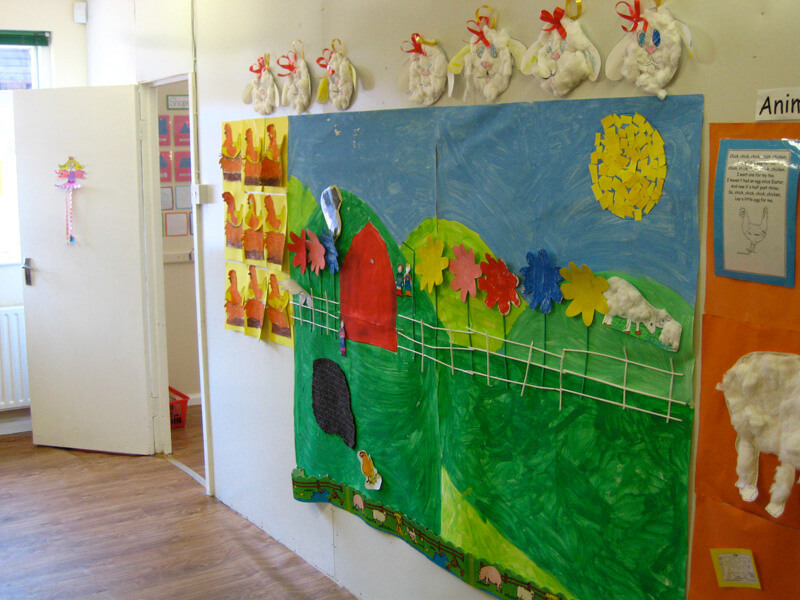 We have three large and spacious classrooms that are crammed with the children’s art and ideas, and an activity area for the messier play that takes place all day long. (Note to new parents: don’t send your child in their Sunday best!). We spend a lot of time out and about getting to know our community and utilise the large green areas for exploring and questioning the world around us. This access to the community is a valuable part of our curriculum. Children typically start with us shortly before their 3rd birthday, depending on when they are toilet trained. We work together with the parent to create a settling in routine that makes the transition from home to pre-school, as soft as possible. The teachers will talk to you about your child’s personality and how well they respond in new situations. We have lots of experience with settling children into our environment, but you know your child the best. By approximately three years old, your child is now readily making connections and understanding boundaries. Through play and an interest-led curriculum, we encourage your child to build relationships with the other children and carers, and question the world around them. For one child, this may mean building confidence, or learning appropriate actions and words when supporting emotional regulation. The curriculum is prepared with the different needs of the group considered, and delivered through positive reinforcement. Families receive a monthly curriculum plan and newsletter through email, and we welcome any input – especially if you have a skill or interest to offer that is evident in our daily plans. This age is also typically when children tend to engage in longer periods of concentration, express individual preferences, and show empathy. We respond to this growth with a more structured routine involving positive language and actions. Activities and materials are age and stage appropriate with direct aims and indirect objectives. This challenging environment will stimulate your child, and the early educators will continually observe and monitor their progress to further extend personal interests. This progress is documented through observation and photographs, which are recorded in individual Aistear Learning Journals, a scrap book where the teacher collects and comments on your child’s development throughout the year, and an art folder, which your child will take home each Friday. The Aistear Framework is complimented with a fully qualified Montessori teacher, where contextual learning is a priority. We shy away from repetitive worksheets to provide learning opportunities through play. Playing ‘shop’ creates many opportunities to use mathematical language and understanding, and we learn about letters by going out into the community with a camera and mark-making materials, to find the letters on road signs, car registrations, or drain covers! Each week, we engage in many fun games and role-play, with the Fantastic Friday theme. This is detailed on your monthly plan, and may include something as simple as Spots and Stripes Day, to the Winter Olympics! Staff and children (and the odd parent! ), dress up and make for a noisy and energetic end to the busy week. At Kids Klubs, we are lucky most families continue on from the pre-school service we offer, to the breakfast and after-school club. Many use this service throughout their entire primary education, and then often return to complete work experience during transition year! We have been fortunate enough to build trusting relationships with families for more than a decade, and the children in our care experience consistency, as well as spending time with their extended families, as we often have several siblings, cousins, and close family friends also attending. The breakfast club starts at 7.45 am and children come along with their breakfast and a toothbrush, and enjoy a social breakfast, before brushing their teeth and heading off to primary school. We offer drop off and collection from Bayside National School. The after-school club is split into two groups: one for Junior and Senior Infants, and the second for children in 1st – 6th class. We plan monthly for these groups, with the emphasis being on messy arts and crafts, and stimulating activities that are rarely experienced at primary school. We wish for the children to be able to complete their homework in an relaxed environment with the support of the after-school teachers, before they have an afternoon tea, provided by the parent, and then off the local basketball courts or green areas for some fresh air and physical games. We want your child to unwind from the structure of primary school and view Kids Klubs as a home-from-home environment, where their questions and views are responded to in a respectful way. Responsibility is a large part of the after-school club so the children are involved in as much as the planning and preparation of their daily routine as possible. Address : Archdeaconry View, Kells, Co. Meath. We opened our doors in May 2008, and have since become an integral part of the Kells community. It is a purpose-built centre catering for children aged 6 months – 12 years, with bright, spacious, and homely rooms, which invite you into a child-centred world. At Kids Klubs we recognise the first three years of life are a special and unique time for developing life-long skills. These are known as the ‘lightbulb’ years, and include a critical time for the healthy development of the brain. During this period, the child’s everyday experiences play a fundamental role in their development, and lay the foundation for their future learning journey. To successfully achieve this, we incorporate the Aistear curriculum, www.ncca.ie, which is designed around four main themes: Identity and Belonging, Communication, Exploring and Thinking, and Well-Being. Through Aistear guidelines, we encourage an emergent curriculum involving hands-on activities which are age and stage specific, and provide meaningful experiences for the child. This includes lots of messy play where your child explores their environment through their senses. 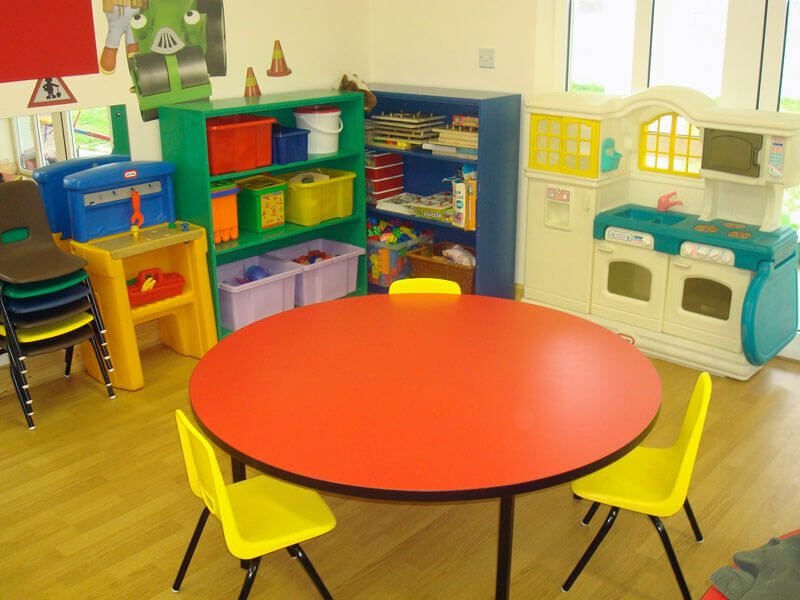 In addition to the Sleep Room, where each child has their own cot and bedding, the Littlies Room hosts a large, comfortable chair for your young child to enjoy one-to-one time with their keyworker. Kids Klubs combine the Aistear framework with nurturing, loving, and confident carers, where positive interactions are key. The key worker records your child’s daily care routine in a personal book, which we send home daily. Aistear Learning Records and photographs are also carried out a minimum of two per term to monitor your child’s progress and personality, as well as bundles of creativity as your child engages in endless sensory play. At this age, we believe in small achievable goals. We are expanding on the experience-led opportunities from the Littlies Room, by introducing more open-ended language and materials. We encourage confidence, risk-taking, and building resilience, through varied and challenging activities. We support your child to gain independence through positive interactions and relationships, and freedom of choice and expression. This is also the time when toileting typically takes place, therefore, care of self is an important element of the daily routine. It is important to us that your child learns it is okay to make mistakes, and to gain coping strategies for when things go wrong. This age group is also becoming more aware of the feelings of others, but it is worth remembering – we don’t always have to share!! The early educators observe and record your child’s progress using Aistear Learning Records, and use photographs to capture these moments. A minimum of two observations per term will be sent home, in addition to a personal scrapbook where the carers collect and comment on different aspects of your child’s interests throughout the year. As your child has been afforded the freedom to wallow in play, they are now readily making connections and understanding boundaries. Children tend to engage in longer periods of concentration, express individual preferences, and show empathy. We respond to this growth with a more structured routine involving positive language and actions. 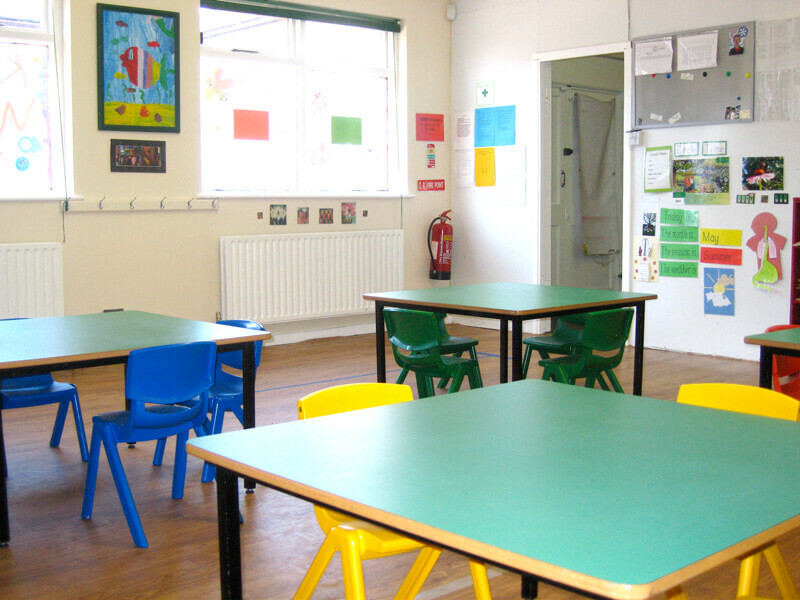 Activities and materials are age and stage appropriate with direct aims and indirect objectives. This challenging environment will stimulate your child, and the early educators will continually observe and monitor their progress to further extend personal interests. This progress is documented through a minimum of two Aistear Learning Records per term, a scrap book where the teacher collects and comments on your child’s development throughout the year, and an individual activity book and folder, which your child will take home each Friday. Kells opens at 7am for the breakfast club, where children can enjoy a nutritious and varied start to their day at our buffet style dining, before heading off to primary school. When your child returns from school, teachers will offer a calm and relaxed atmosphere, and support to your child to complete homework. We want your child to unwind from the structure of primary school and view Kids Klubs as a home-from-home environment. Activities include arts and crafts, sensory and imagination play, music and movement, and baking. Responsibility is a large part of the after-school club so the children are involved in as much as the planning and preparation of their daily routine as possible. The after-school group also spend the majority of the afternoon in the garden area: we are conscience they have been on a school bus or in a car, and been sitting in a classroom environment so we strive to lose the chairs and move!!! Kids Klubs is a well-established childcare service that has been run by a dedicated and highly qualified team since 1989. We have branches in Bayside, Dublin 13, and Kells, County Meath. At Kids Klubs we offer an enjoyable place where your child will discover their own potential, under the guidance of qualified and experienced childcare workers. "Our daughter started with Kids Klubs aged 3, part time. Today, 3 years later, she still attends the breakfast club and after school club. The staff are very professional and our daughter is always very happy!" "My grandson attended Kids Klubs and he was happy there. His speech wasn't great when he started but by the time he was finished, he was speaking perfectly. The staff are friendly, trustworthy, hardworking, and always put the children above everything else." "Aimee has been attending Kids Klubs since July 2008, when she was 7 months old. She has been in all the rooms from the Baby Room right up to after-school care, and has enjoyed all aspects of Kids Klubs. She is now 7 years old and still very happy to be attending Kids Klubs." © Copyright 2018. All Rights Reserved Kids Klubs Childcare.